Charles-Louis Hanon "The Virtuoso Pianist" contains a set of piano exercises for any level. 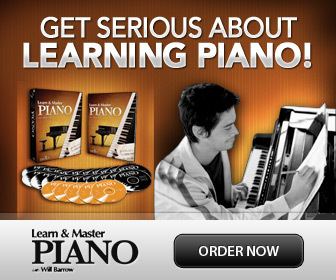 They are usually taught at a more advanced level but are great also as you start to learn piano, especially for adult beginners who wants more finger dexterity. If you look at Hanon's five finger exercises for piano they perhaps look really difficult… But don't let the sheet music scare you away! The notes can look really intimidating on paper, but as you will see, the exercises in the beginning are actually just rather simple 5-finger patterns repeated again and again, ascending and descending. Why are the Hanon Piano Exercises So Great? The first part of the exercises are simple and easy to learn and memorize. I find them the quickest way to "get the fingers going". You will quickly and efficiently practice all possible combinations of movements between all fingers. By doing so, you will also very soon notice a huge difference in the feeling of agility in your fingers. It's not the only piano exercises you need; to develop a good piano technique you also need to work on more aspects involving different movements and how to use your whole body when playing. But the exercises are as good as it gets when you need effective piano finger exercises that are easy to learn. So, how do you get started as a beginner? Yes, they are so easy you will learn them by heart, but get the music for reference. You can get the Hanon sheet music on this page for free. But the notes can be a bit intimidating- they are small and written as 16th notes. Not that this matters, they are still easy to learn as you will see below. I recommend this edition called Junior Hanon, for beginners. It's the same piano exercises just written in a much more understandable way. 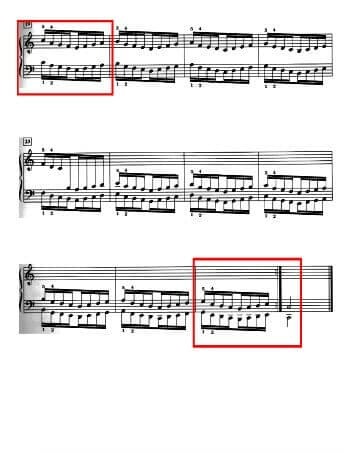 The layout is easier to read and the notes are written as 8th notes. Learn the first measure in your right hand. 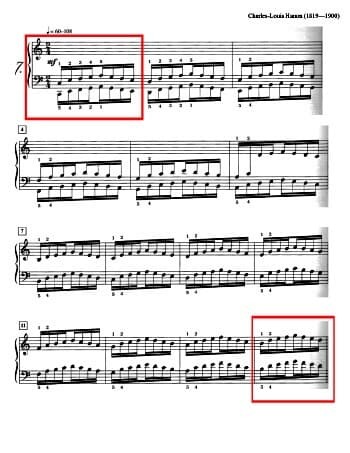 This same pattern is then repeated one note higher each time until the middle of the Hanon exercise. Learn the two measures in the middle, where the exercise "turns" and continues down the same way. Learn the last measure where it ends. Now repeat this with your left hand. Finally repeat this with both hands, but much, much slower. So you actually need to learn only 4 measures! Memorize them too, it's easy. Learn the measures in the red boxes. The first and the last on this page. And the first and the last on this page too. Step 10: Play slowly the whole exercise with both hands, preferably by heart. Increase speed gradually as you feel more confident. Depending on your time available and your level you could learn this all at once. If it feels difficult to do, I recommend to divide the exercise as above, but spend 1 day on each step. As you do, you will still reap the benefits from the exercise. Not only when it's ready! All the five-finger drills in Hanon piano exercises are made the same way. So you can use the plan for all of them. You don't even have to learn them all to feel the result in your now much more nimble fingers! Focus on learning a couple or more, and keep playing them daily for best results. Let me know how it goes in the comments below!